Follow Kraushaar Galleries on our INSTAGRAM account @kraushaar1885 for gallery news, artists of the day, new exhibitions, and more. To welcome the 2017 baseball season, artist Lee Walton has created a series of 15 drawings based on significant games in Atlanta Braves history for the Atlanta Airport Art Program. In these visual box scores, Walton constructs a system that translates and records the action of the games into the drawings before you. Acting as a visual guide for a live athletic performance, Walton's system interprets the unfolding game; curved graphite lines stand for base hits; a fly ball out is a straight line and angle; a double is a wide stripe running top to bottom; a home run is a thick dark blue line across paper; areas of wash represent strikeouts and walks; errors are bright green line segments. For more information and images of the 15 drawings, please visit Lee Walton's website. This event is free and open to the public, and features over sixty curator & artist talks where you can hear from experts about collections on view. To learn more and register, please click 'Calendar' on the event website to RSVP for the curator and artists talks at the galleries of your choice. Kraushaar Galleries will host an artist talk with Catherine Drabkin at 1 pm. She will talk about her work, approach to painting and thoughts on process and inspiration. The University of Richmond Museums opens CROOKED DATA (Mis)Information in Contemporary Art on February 9 through May 5, 2017, in the Joel and Lila Harnett Museum of Art. The exhibition features art by twenty-one contemporary artists and studios who work with data in nontraditional ways, including the work of Lee Walton. Some artists incorporate data from known sources, using it as an aesthetic device divorced from its originally intended interpretive function. Others gather and manifest data that might normally be considered not worthy of collecting. And some of the works explore alternatives to standard data visualization forms and practices. More information including an online exhibition catalogue available here. 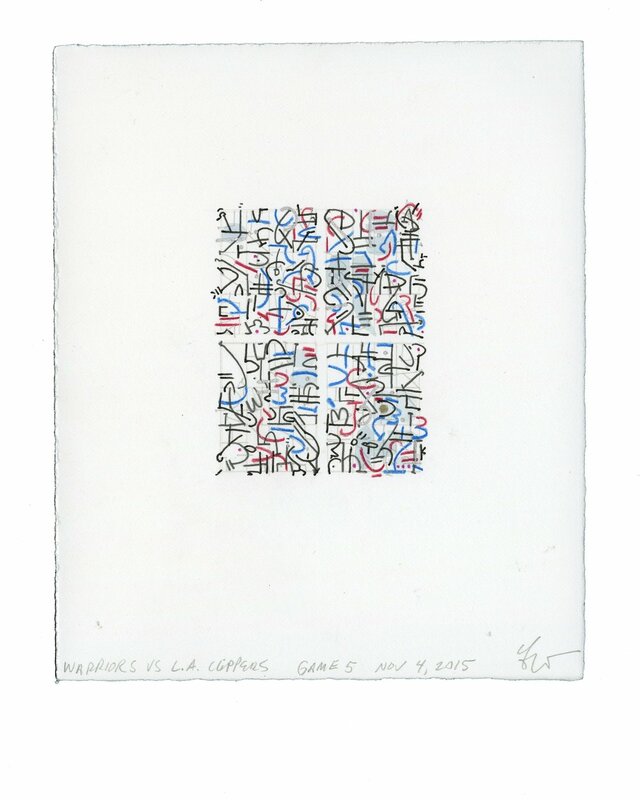 Lee Walton, The Golden State Warriors, 24 Game Winning Streak Plus System Notes and Game 25, October 27 - December 11, 2015, 2015, ink and wash on paper, 7.25 x 6.25 inches (18.4 x 15.9 cm), details Game 3, Game 5, Game 23. "The impetus for the exhibition is a painting by Beal that was acquired in 2014 with funds raised by the Friends of the Palmer Museum of Art, titled After the Storm, from c. 1930, in which lobster fishermen scour the shore for traps and buoys that have been scattered by a gale. The painting is also accompanied by a selection of prints and drawings featuring images of Rockport’s fishing industry, all recent gifts from the estate of Gifford Beal made through the efforts of Kraushaar Galleries, which gave the artist his first solo exhibition in 1920 and thereafter served as his dealer for the remainder of his career." For more information, please visit the Palmer Museum of Art website. Katherine Degn, Director/Partner, of Kraushaar Galleries is featured in the November/December 2016 issue of American Fine Art Magazine. Read her report on the state of the art market below or stop by the gallery to pick up a copy of the current issue. November 3rd through December 16th, 2016, Kraushaar Galleries will present our new exhibition INTERIOR VIEWS, featuring paintings and works on paper by Gifford Beal, Romare Bearden, Guy Pène du Bois, William Glackens, Everett Shinn, John Sloan, Marguerite Zorach, and others. On November 21st, 2016, from 10am-2pm, we will be participating in JUST OFF MADISON, an open house for American art private dealers located along Madison Avenue. Please contact the gallery for details or visit the website for a map and complete list of galleries. John Sloan, X-Rays (The Fluoroscope), 1926. Etching and aquatint, Plate Dimensions: 10 x 8 inches. Kraushaar Galleries will also be presenting in MASTER DRAWINGS NEW YORK 2017, which will run January 21st through 28th. Please see the website for a full list of participating galleries. "Innovation and Abstraction: Women Artists and Atelier 17," an exhibition of abstract graphics and works in other media by eight artists, will be on view at the Pollock-Krasner House and Study Center from August 4 through October 29, 2016. Organized by guest curator Christina Weyl, PhD, co-founder and co-president of the Association of Print Scholars, the exhibition highlights the innovative techniques developed at Atelier 17, an experimental printmaking studio that operated in New York City from 1940-1955. Nearly 200 artists made prints there, almost half of them women. The exhibition focuses on a core group--Louise Bourgeois, Minna Citron, Worden Day, Dorothy Dehner, Sue Fuller, Alice Trumbull Mason, Louise Nevelson and Anne Ryan--who bent traditional printmaking rules and explored uncharted aesthetic terrain in various intaglio and relief printing techniques. For more information, please visit their website. 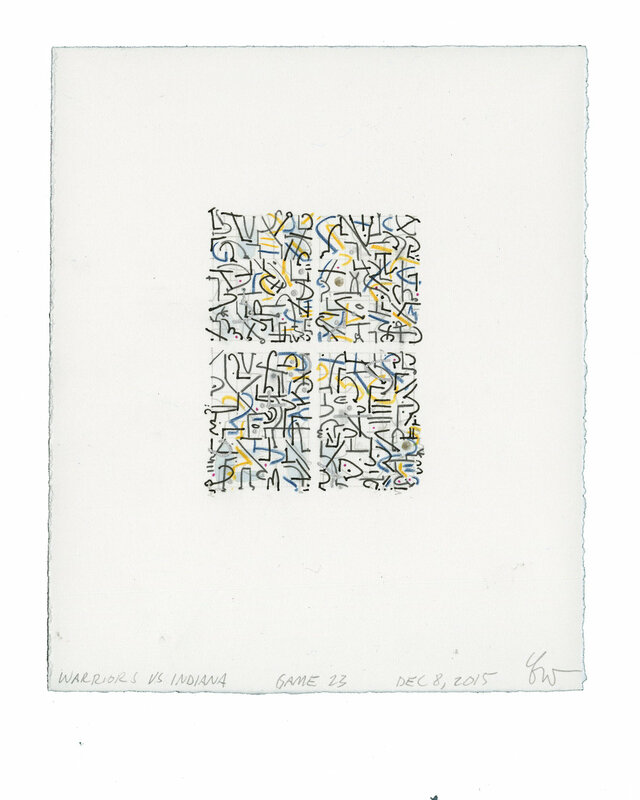 Kraushaar Galleries will be participating in the 23rd Annual Minneapolis Print and Drawing Fair. Located at the Minneapolis Institute of Art, Minnesota, the fair will run September 17 - 18, 2016. According to the MIA website, the fair will include hundreds of original works of art on paper for sale by 13 leading dealers from the United States and Europe with proceeds benefiting the Department of Prints & Drawings Acquisition and Educational Funds. For more information please visit http://new.artsmia.org/23rd-annual-print-drawing-fair/. Catherine Drabkin is one of the five regional artists featured in Inside Out, a new exhibition at the Delaware Art Museum. With Inside Out, "each artist explores the concept of 'place'—physical, emotional, and spiritual—in their work, using a variety of media, including oil, acrylic, and gouache." The exhibition is on view through April 24, 2016. For more information, please visit the Museum website. You Go Girl! Celebrating Women Artists recently opened at the Heckscher Museum of Art in Huntington, New York, and will run through April 3, 2016. Kraushaar Galleries' Dorothy Dehner is one of the many outstanding women artists featured in the exhibition. "The exhibition presents more than 50 artists from the late 19th century through today. Working in representational and abstract styles, the artists in You Go Girl! express a wide range of concerns that often mirror those of their male colleagues, while sometimes challenging traditional artistic boundaries and male authority." The Art Dealer's Association of America created a block-by-block guide to the galleries of our Upper East Side neighborhood along with a list of their current exhibitions. You can view the list at this link. Stop by Kraushaar Galleries to view our new show of 20th Century of American Art, including paintings and works on paper by Thomas Anshutz, Dorothy Dehner, Charles Demuth, William Glackens, John Heliker, William Kienbusch, John Koch, Alfred Maurer, George L. K. Morris, John Sloan, and Esphyr Slobodkina among others. On view through Thursday, December 24. On view will be a selection of early to mid 20th century works by American artists. 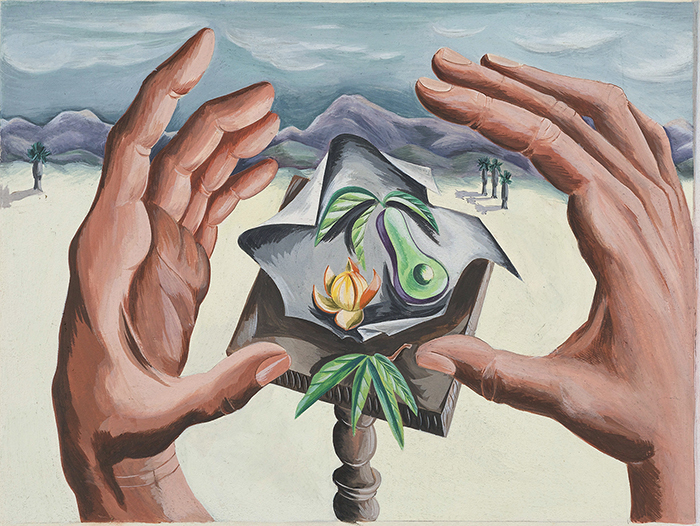 On view will be a selection of paintings and works on paper from 20th century American artists. "One of this country’s most important artists of the early 20th century and a highly respected teacher, John Sloan (1871-1951) spent five summers—1914 through 1918—living and working on Cape Ann. During that time he created nearly 300 finished oil paintings, using Gloucester’s rugged landscape as a backdrop to experiment with color and explore ideas about form, texture and light. Arguably the most productive period of his career, the body of work that Sloan created during this time continues to astonish and delight viewers a century after it was completed." The exhibition opens Saturday, July 11th and continues through Sunday, November 29th, 2015. For further information on the exhibition, please visit the Cape Ann Museum's website: John Sloan Gloucester Days . "Between 1900 and 1910, John Sloan produced a weekly series of word and picture puzzles for the Sunday supplement of the Philadelphia Press, one of the country’s leading illustrated newspapers. The Puzzling World of John Sloan will explore this little-known facet of Sloan’s early newspaper career, presenting more than 25 works from the Museum’s collection. On view for the first time, the puzzles demonstrate the artist’s imagination and verbal and visual wit, as well as the fluid boundaries between fine art and newspaper illustration in the first decade of the 20th century. This exhibition encourages visitors to solve Sloan’s complex puzzles." Work by Dorothy Dehner is included in Painting on Paper: American Watercolors at Princeton. The exhibition opens Saturday, June 27th and continues through Sunday, August 30th, 2015. For more information, visit the Princeton University Art Museum's website: Painting on Paper: American Watercolors at Princeton . The New York Times reviews "Figuratively Considered"
Never underestimate the gems by unsung artists to be found along the less-traveled byways of the New York gallery world. Case in point is a selection of paintings, drawings and prints by American artists at the Kraushaar Galleries, which was founded in 1885 and is still going. There’s plenty to look at here — paintings by George Luks, William Glackens and John Sloan, and drawings by the sculptors Gaston Lachaise and Dorothy Dehner — but three works are especially rewarding. Two are canvases from 1938-39 by David Park (1911-60), a painter at least as original as Richard Diebenkorn, whose figurative work Park influenced. Park died young, but not before perfecting a haunting balance of heavy brushwork and a snapshotlike sense of movement, light and human character. The two delightful portraits of Park’s wife, Lydia, in this show indicate his confident study of the latest from Picasso, his paintings of Marie-Thérèse Walter and Dora Maar at a time when New York artists were gripped by his Cubism. 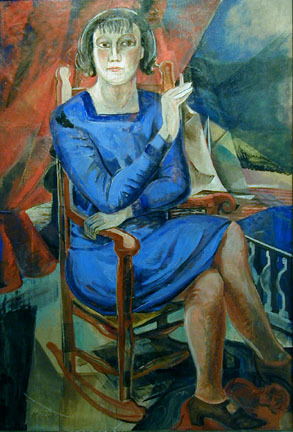 The other draw is “Bea Ault,” a 1925 portrait by the resourceful Marguerite Zorach (1887-1968), an early adopter of Fauvism who was included in the 1913 Armory Show. The painting is bold in every way: its size, its palette of reds and blues, and especially its sophisticated mix of Cubism and folk art. Pictured in a rocking chair, smoking, its subject stares us down. On view will be Figuratively Considered, A Selection of Early 20th Century Figurative Works, with examples by Guy Pène du Bois, William Glackens, George Luks, Alfred Maurer, John Sloan, Marguerite Zorach and others.